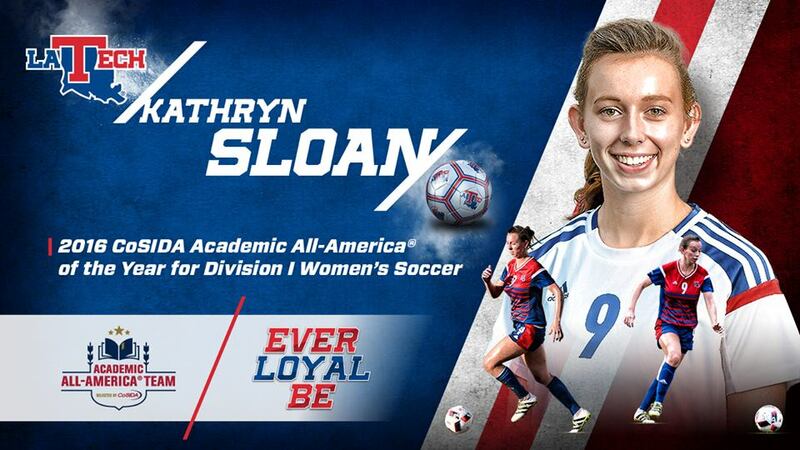 Louisiana Tech senior forward Kathryn Sloan has received numerous awards during her stellar four-year career on the soccer field and in the classroom, but the honor she received on Tuesday trumps them all. In an announcement made by the College Sports Information Directors of America (CoSIDA), Sloan was selected as the 2016 Academic All-America of the Year for Division I Women’s Soccer. A communication arts and design major with a perfect 4.0 grade point average, Sloan becomes the first student-athlete in LA Tech history to receive this prestigious honor. She was a third team CoSIDA Academic All-America selection last year. The Kansas City, Missouri native has also been a three-time recipient of the Commissioner’s Academic Medal as well as a three-time C-USA All-Academic First Team honoree. “Katie Sloan has exemplified what we want our student-athletes to be during her four years at Louisiana Tech,” athletics director Tommy McClelland said. “She is one of 14 student-athletes in Louisiana Tech history to be named an academic All-American and just the third to earn the honor multiple times. That’s impressive enough in its own right. The striker has been equally as impressive on the pitch during her four years as a Lady Techster. She has helped compile an overall record of 48-30-6 while also leading the team to three straight C-USA Tournament appearances despite being picked each year in the preseason to finish towards the bottom of the league. Sloan has always been more proud of the team’s accomplishments rather than her own which there are a bunch. Her name is littered throughout the LA Tech record book. She is the Lady Techsters’ all-time career leader in almost every statistical category – points (89), goals (36), shots (231), shots on goal (120) and game-winning goals (13). She led the team in scoring every season, including this past year when she became the first Lady Techster to be named First Team All-Conference USA (was a second team honoree in previous two seasons) after registering nine goals and six assists for a total of 24 points, all ranking in the top three in the league. Sloan becomes the first LA Tech student-athlete to ever be selected as the Academic All-America of the Year and the first in Conference USA since 2006.